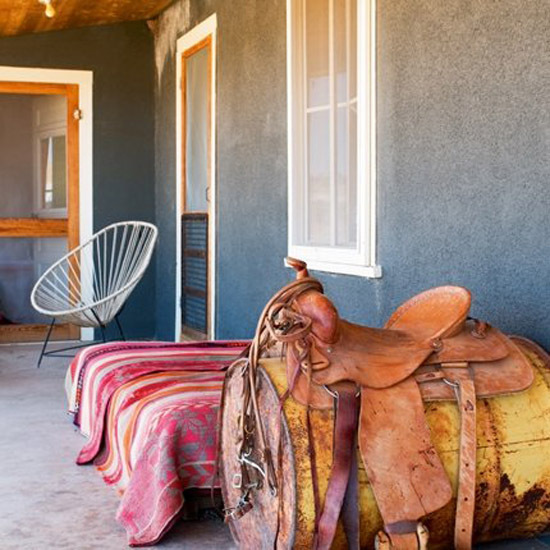 Marie Claire Maison featured Liz Lambert's (the Bunkhouse Group) ranch house recently on their site, and of course being a fan of their hotels, El Cosmico, Hotel Havanna and Hotel San Jose, I thought it was only fitting to feature this little gem. Not only was I delighted to see it I loved the idea behind it where owner Liz Lambert encouraged her friends of designers, architects and artists to create a line of furniture and even plumbing made of scrap material left in the surrounding fields; the result, an assortment of recycled pieces that all pull together so cohesively and fit so well into the Liz Lambert aesthetic. (Photos: Vincent Leroux/Temps Machine). 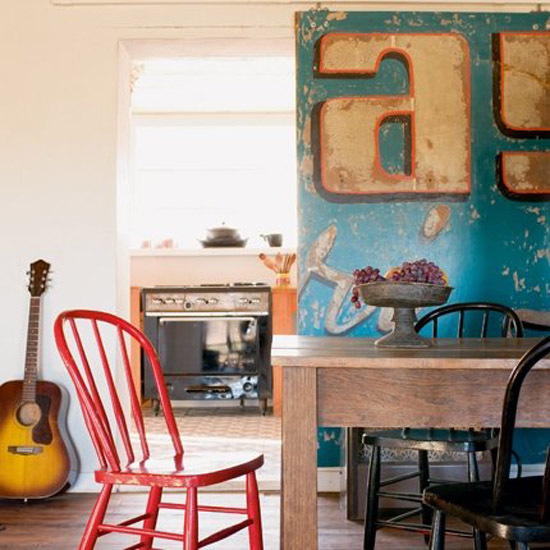 Transformed into a barn-style sliding door between dining room and kitchen, a sign peeling from the Holiday Capri Inn, a motel restored by Liz. Chairs traditional western farms and fruit bowl pewter. The guitar is a "Guild" 1970 Collection of the famous folk singer Amy Cook. Below: A table porch, with it's obvious simplicity, placed on two old barrels. The bedroom floor is covered with a marine paint turquoise. On the bed, a "serape" former Mexican striped, a bolster bag mad of floursacks and an embroidered pillow. The bathroom with cast iron bath. 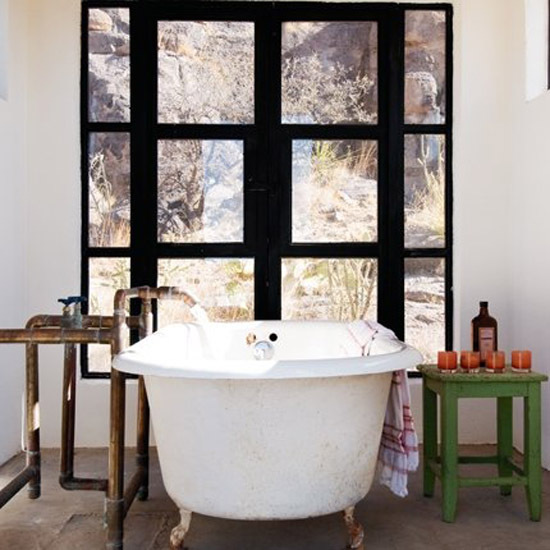 The doors of the bathroom metal frame painted black and to feed the old cast iron tub –copper pipe water faucets. 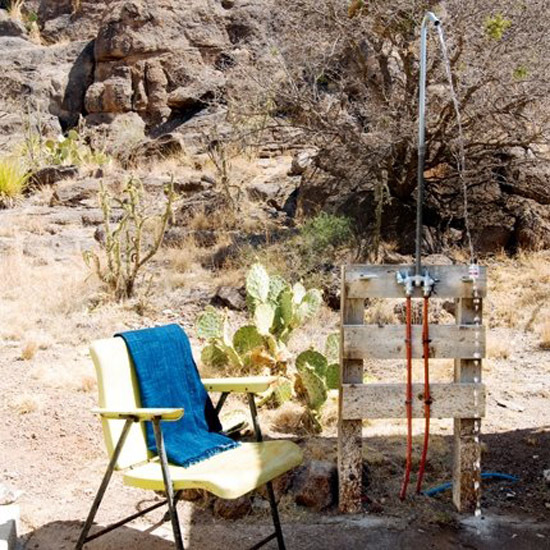 The outdoor shower, simple pipe and aluminum industrial valves mounted on an old wooden structure, a vintage painted metal chair (designer - Russel Wright). Japanese napkin dyed indigo. 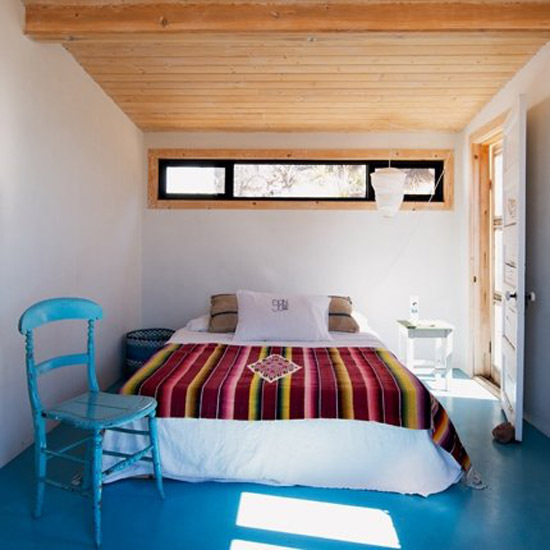 I was also thrilled to find out El Cosmico - one of their hotels has an online shop selling some of their beautiful Bolivian blankets, Ozark Roadside Pottery and more. Exciting stuff! See below and click here to see more. Hi, I want to show you two design companies you may like. One is Boca do Lobo, and it´s a furniture design companie. And the other one it´s Delightfull, and it´s a lighting design companie. Thank you "h" i'll take a look! I adore this kind of casual hotels, were everything seem that just felt down and it is absolutely well placed. It is indeed nice. Want to have that soon. Everything about this place is marvelous. 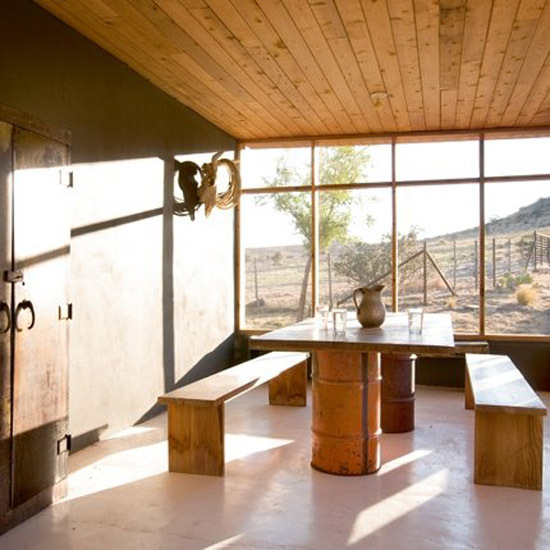 And what’s good about this house is that most of the materials used are recycled and from scraps. Although there are plenty of elements and patterns in the house, each piece complements the other. And that’s what makes this space spectacular.